Marc Chagall called "love" the primary color of his paintings. The central source of the love in his life was his wife, Bella. They met when Bella was a teenager in their home town of Vitebsk, Belarus. In 1915, Chagall finally married Bella, despite the opposition of her parents, who wanted a better match for their daughter. 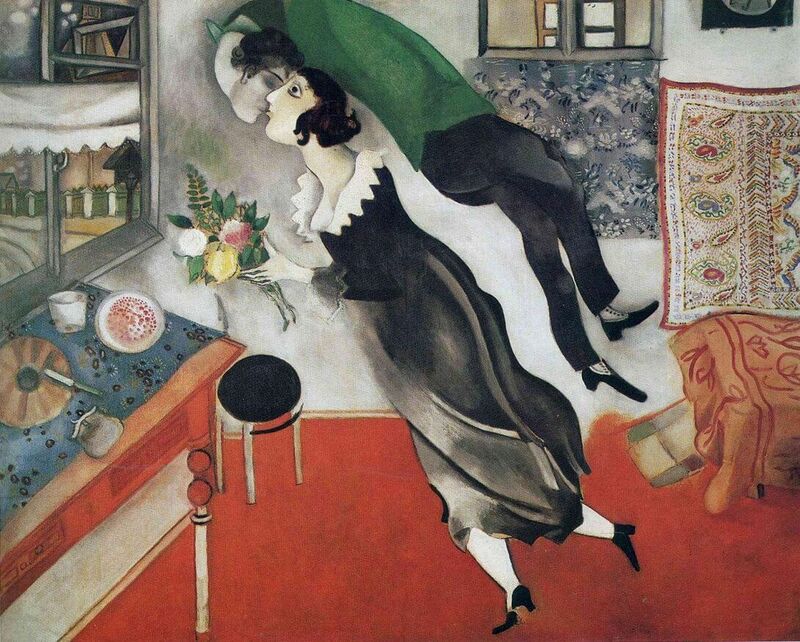 The Birthday was painted by Chagall in 1915 just a few weeks before he and Bella married. The painting is a wonderful expression of the amazing, flowing and powerful love these two shared. Chagall is pictured flowing and dream-like, floating above Bella. His head is unrealistically craned upside down and backward as he twists around to kiss his future wife on the mouth. Bella is depicted holding a cheerful bouquet of flowers and also floating in the air, as if just lifting off. The couple is suspended in loving bliss in a bright living room setting dominated below by a vivid red carpet. The painting is balanced above by the ivory, beige and tans of the living room furniture and wall decorations. As in The Birthday, Chagall's art of the time is executed mostly in the Cubist or Expressionist styles. The painting is a marvelous creation which powerfully conveys that feeling of euphoric love between young lovers in a blissful yet ordinary setting that seems to ooze happiness out of every square inch of canvas.